The U.S. rig count has been on the rise for months, despite some recent hiccups, but Canada’s rig count recently plunged amid low oil prices. Canada’s rig count fell from 210 to 136 for the week ending on December 29, a massive drop off. That took the rig count to a six-month low. Obviously, the losses were concentrated in Alberta, where most of the rigs tend to be. Alberta’s rig count sank from 162 to 118 in the last week of 2017. But Saskatchewan also saw its rig count decimated—falling from 43 in mid-December to just three at the close of the year. The losses can likely be chalked up to the meltdown in prices for Canadian oil. 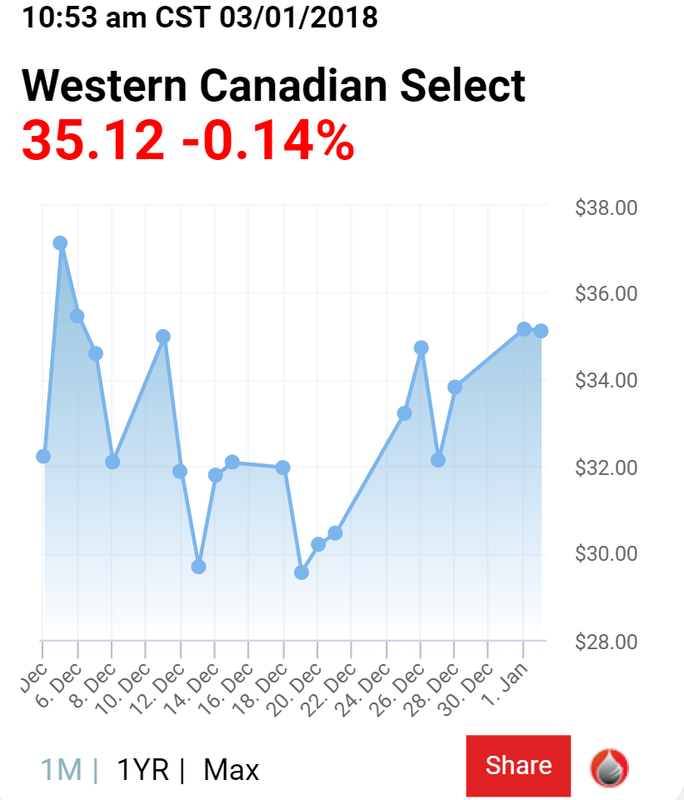 Western Canada Select (WCS), a benchmark that tracks heavy oil in Canada, often trades at a significant discount to oil prices in the United States. But the WCS-WTI discount became unusually large in November and December for a variety of reasons. The outage at the Keystone pipeline led to a rapid buildup in oil inventories in Canada, and storage hit a record high in December. Also, Canada’s oil industry has been unable to build new pipelines to get the landlocked oil from Alberta to market. Alberta oil producers are essentially hostage to their buyers in the U.S., and with oil production now bumping up against a ceiling in terms of pipeline capacity, the glut is starting to weigh on WCS prices. In December, Enbridge announced that it will ration the space on its Mainline oil pipeline system for January as Canada’s pipelines are essentially at full capacity. Enbridge said that it will apportion lines 4 and 67, which move heavy crude, by 36 percent. The term “apportionment” is a euphemism for rationing—essentially oil producers are unable to get all of their product onto the pipeline and are hit with restrictions. That means the oil has to be diverted into storage. Related: Is ISIS About To Attack Libyan Oil? In short, there’s somewhat of a glut of supply in Canada right now. The problem is that there’s little prospect of a solution in the near-term. Railroads, although they are taking incrementally more cargoes, cannot handle the excess supply all on their own, especially with new supply coming online. And there are no serious pipeline capacity additions expected for about two years at the earliest. The three main proposals—Kinder Morgan’s Trans Mountain Expansion; TransCanada’s Keystone XL; and Enbridge’s Line 3 replacement—all face legal questions and uncertain completion dates. On top of that, Canada’s oil sands producers are adding new supply. At today’s prices, it makes little sense to greenlight new upstream projects, particularly in expensive oil sands. But there are still some projects that are finishing up that were given the go-ahead years ago when oil prices were substantially higher. Suncor Energy is set to bring its Fort Hills project online, which will add nearly 200,000 bpd of new supply within 12 months. That all means that the pressure on WCS probably won’t go away. The price meltdown from two months ago is probably now showing up in the rig count. The U.S. typically sees the rig count fluctuate in response to changes in the oil price by several months, and the rig count in Canada will only now start to reflect the price plunge from months ago. The rail industry might handle more oil cargoes, which could help push up WCS a bit, but the larger-than-usual discount might persist for some time. In short, Canada’s oil industry faces more obstacles than, say, the much-watched shale drillers in the United States. The U.S. rig count is closely tracked around the world for clues into what happens next in the oil market—an increase is assumed to mean that more U.S. shale supply will be forthcoming while a decrease is a sign of market tightness and potentially higher prices. The publication of this weekly data has global implications. 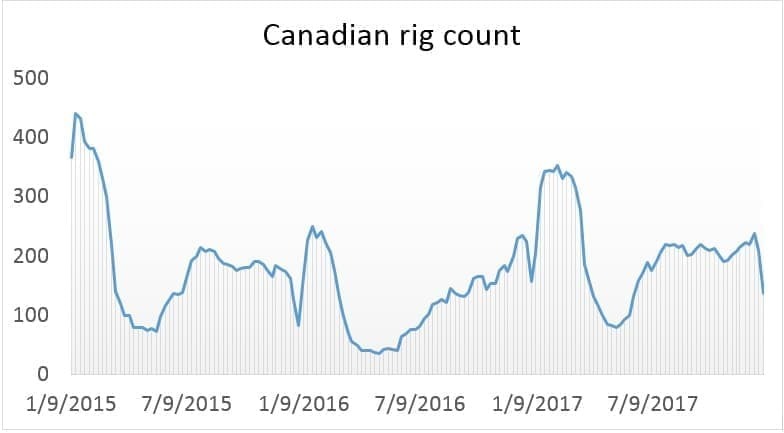 Canada’s rig count, on the other hand, could continue to struggle even as U.S. shale drillers spring into action in response to higher prices. Canadian producers won’t benefit as much from the upswing in the global market due to their local and regional problems, mostly related to the lack of pipeline capacity. that's why we Alberta people felt betrayed by the rest of Canada when other provinces are doing everything they can to stop our pipelines from being built. It would probably be better for Alberta to become the 51st state of USA. - 196 rigs for the week of December 18, 2017. - No report for the week of December 25, 2017. Someone is not capable of counting lol, or maybe a typo!? In Canada climate politics is killing the oil industry. Alberta just jacked up the carbon tax by 50% to $30 per ton. On the top of that the Federal Socialist Government of Mr. Trudeau is adding another $10 per ton of federal carbon tax, and this price will escalate to $50 per ton by 2022. Beside that, pipeline politics by Federal Government is adding insult to injury. In Canada it takes a generation to build the pipeline. The whole world has got more to say, if Canada will be allowed to build the pipeline, but Canadians. When our southern neighbors are cutting taxes, removing regulations, getting out of Paris climate deal, the Canadian Fed. Government is doing exactly opposite, adding new taxes, adding NEW regulations on the top of existing ones, driving Paris climate agenda and on, and on......on. I am not surprised, that the number of rigs in Canada keeps crushing. Alberta and Federal Governments are working on another plan after killing the oil business. They are implying, that legalizing WEED-Marijuana, and growing it, will be the new boom industry and it will fulfill their GREEN agenda. So, instead of working in the oilfields of Alberta, I will be selling WEED - legally. Complete conjecture. In Canada drillers always try to shut down for the Christmas holidays. A lot of this has to do with safety as history has proven rigs are safer when the crew's minds aren't elsewhere. Back up to 248 yesterday and will continue to climb. Canada's rig count was at 248 rigs yesterday.... imagine that. In Canada we shut down some of our operations for Christmas and New Years to let our hands have some time off with their families. And due to our tighter reporting standards and practices we are actually able to report exactly how many rigs are operational unlike Baker Hughes best guess. You're spot on about the pipeline capacity though! WCS is primarily heavy bitumen based and is actually mined and not pumped out of the ground. WCS is not fracked or conventionally drilled and pumped out , so how exactly does the WCS price affect rig count ? I'm a tad confused. Rigs like to wrap up before the break and move in the first week. Plans to drill are on the rise in Alberta year over year. Hey Citizen Oil. It's called SAGD. Steam Assisted Gravity Drainage. Pairs of horizontal wells are drilled, one above the other. Steam goes into the top horizontal well and the oil is headed and drops to the lower horizontal well. The heated oil is pumped to surface and the water and heavy oil are separated. There are thousands of these well pairs. Most of the reserves in the oil sands are too deep to be accessible by surface mining, but surface mining gets the press because it looks ugly to the movie stars. In the future, most bitumen will be produced by these wells. Could it just be winter? Rig count plot shows annual, significant rig drops every year just as winter shows up. The Canadian rig count is back over 300. It was merely a shut down for Christmas and New Years. Happens every year. Happy New Years everyone.